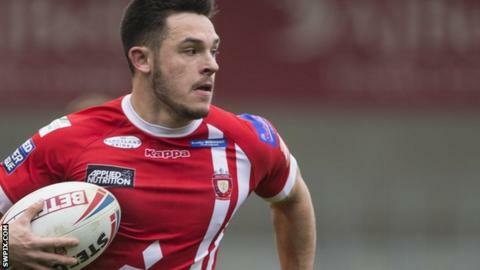 Niall Evalds scored four of Salford's 13 tries as the Super League side thumped Championship club Rochdale in the fifth round of the Challenge Cup. The Hornets were thrashed in the absence of head coach Carl Forster, whose partner gave birth to a daughter just hours before kick-off. Evalds grabbed two first-half tires to help put Salford 40-6 up at the break. He added a further two after the interval, with Jake Bibby also scoring twice in an easy win. Bibby's first score came after Shaun Ainscough grabbed Rochdale's only response, touching down in the corner after getting onto a low kick from Dan Abram. It was just a fleeting reprieve for a side that had been 34-0 down before the half-hour mark, Evalds' double coming among an avalanche of tries that started with Greg Burke going over in the third minute. "It was a good professional performance. "We have got two big games coming up against Warrington and Wigan and we've got some confidence back tonight. "We have had a bit of a discipline issue and also struggled with execution in recent weeks but our defence has been good. Tonight we fixed a few things." "The effort was good but we didn't expect that score. There were some positive performances from some of the lads but others were not on top form. "Salford are a team that attacks really well and it was a top performance from them. We will take the positives and move on from there but we needed more from some of our lads tonight." Salford Red Devils: Evalds; Chamberlain, Inu, Sa'u, Bibby; Lui, Hastings; Walker, Tomkins, Dudson, Jones, Griffin, Burke. Interchanges: Welham, McCarthy, Nakubuwai, Wood. Rochdale Hornets: Kay; Ainscough, Higginson, Morris, B Wood; Whittaker, Abram; Ryan, Moores, Reidy, Gillam, Weldon, Millington. Interchanges: Talatoka, Carberry, Cottington, C Wood.